The role of traditional media such as print, television and radio is changing. Combined with the rise of digital marketing and new media being introduced almost daily, the existing advertising and marketing budgets of most companies lie in a state of transition. And transitions present a challenge. To deftly navigate the sea of media now available to your company it is imperative that you have a knowledgeable team on board. For over 20 years The Caplan Group has helped our clients develop advertising and marketing strategies that most effectively support their business. 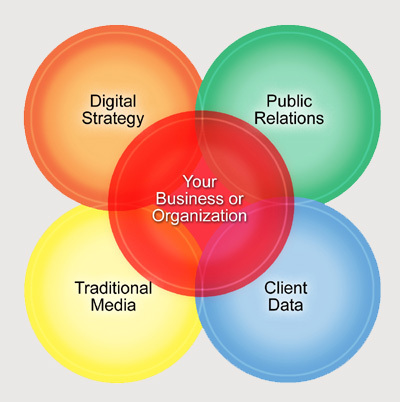 We have combined our expertise in traditional media, digital online marketing, public relations and data management to bring our clients a fully integrated, cost effective, results oriented communications strategy. We do not focus on simply driving traffic to your business or organization; we continually analyze the responses to our marketing and adjust when appropriate. We recognize that our clients advertising and marketing plan must remain agile. The Caplan Group utilizes measurable advertising and marketing solutions, both traditional and digital, that are designed to directly target your customer. As a result, your advertising is more effective and your budget is more productive. Our passion and our commitment to our clients success has enabled The Caplan Group to develop an expertise in today's fast changing world of advertising and marketing. Allow us the opportunity to show you how we can work together with you to strengthen your business.